A good quality Philips juicer gives you the ability to get the most out of each fruit and create everything from your regular orange juice to superfood mixes. Unlike a blender, a juicer will remove all the pulp and bits to leave you with a smooth juice with all of the flavour and none of the fuss. Our range of Philips juicers are all dishwasher safe, making them easy to clean after each use. The pulp is collected in an integrated pulp collector which is easily removable, ideal whether you’re using a dishwasher or cleaning by hand. The different models come in a range of sizes, from 1.5 litres up to 2.5 litres for larger juicing needs. 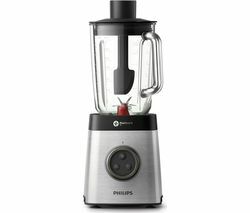 Each Philips juicer not only does the job but looks great too, and will take pride of place in your kitchen. If one of our Philips juicers isn’t what your after then take a look at our Braun Juicers, with practical top-loading designs and a powerful motor meaning you can juice almost any fruit you wish. If you’re after more of a blender than a juicer, look no further than the famous Nutribullet. Well known for their incredible blending power, they’ll turn your fruit into a tasty smoothie in seconds, and are designed with practicality in mind. You simply place your fruit or veg into the cup, blend away and when you’re done you can fasten the lid directly onto the cup you blended in for ultimate ease and portability. The cups are dishwasher safe, and the blade will simply need a quick rinse under your kitchen tap once you’re done. Whether you’re looking for a powerful juicer, or a compact blender, our range of juicers and blenders have something for every home.